Below is a series of images of flags that have been provided to FOTW, but which we have been unable to recognise. If you can identify any of these flags, please let us know! Contact the director. The flag I am trying to identify is red. It has a thin white line running across the center horizontally. About 75% of the way to the right there is a thin white vertical line. The flag looks similar to a mirror image of the Danish flag, except the lines are thinner and the dimensions are more rectangular. I have no idea what kind of flag this could be (country, state, war, maritime, political), but would greatly appreciate any help in identifying it. Thanks for any assistance! I went on a whale watch today out of Kennebunkport Maine. On one of the flagstaffs at President Bush's family compound, flying beneath the American flag, was a flag unknown to me. It was divided horizontally, yellow/orange on top, a pale blue beneath. The colors were similar to those of the flag of Bonaire. A white triangle, base towards the hoist, was at the hoist, extending perhaps one-third the length of the flag. A seal or symbol was in the white triangle, perhaps within a compass rose-like design. Can anyone identify it? Thanks to David Fowler's recent post, I can identify this as the flag of the US Secret Service, which provides security to former as well as incumbent US presidents. Yellow over blue with the former badge of the service on a white triangle in the hoist. No known connection to Ukraine. has a single white star in the center. We have one full size flag and six smaller matching flags. The age would seem to be at least 1950 or earlier, unfortunately there was no information stored with them. We are assuming they are some type of organizational flag. Any information you could give us to point us in the right direction would be appreciated. My father brought back from Europe, post WW II a gonfalon approx. 3 feet x 4 feet (1 x 1.3 m) with a green cross on yellow field, with wide red borders top and bottom. No national markings on the hoist. Wool. Rigging loop and plain 6" rigging line at bottom, so probably naval. The closest thing current that it resembles is the international "R" (romeo). Can you help me figure this out. He was in the UK, France and Germany in 1942-45. thank you! 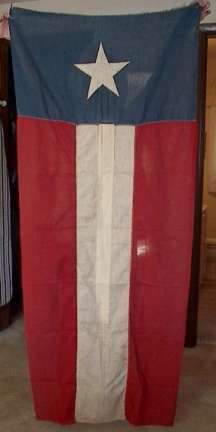 An unidentified flag posted for sale on eBay, September 2002. An unidentified flag posted for sale on eBay, 29 August 2002. Being square, it looks like a banner of arms, either personal, civic, or corporate. Lately I've noticed a black - medium blue - black, arranged horizontally auto tag on many vehicles in the area around Pittsburgh, Pennsylvania. Anyone know what this means? During the World Cup final (2002: Brazil vs.Germany), around the 50th minute was seen on TV a white flag with three red axes. It looked more German than Brazilian. Is anyone to identify it? The website at http://www.mindspring.com/~debard/bardeleben.htm shows a three-axes flag that might give a lead. Not sure it does; it's a reference to his family arms, and the axes there are black. What we saw was white with three red axes. Do any of the towns mentioned on the page have arms/flag like that? Trying to trace identity of a war time badge in flag shape with gold, black and red in horizontal bands and Murphy in gold lettering on the black band. Beneath is the inscription: on national service. Any help with a possible link with the colours would be appreciated. 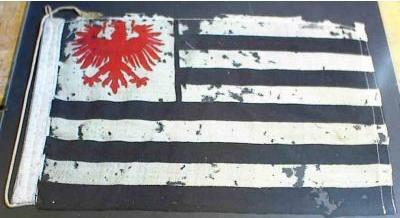 Flag given dates from the around late 1800's. Is it a merchant flag? Looks too long to be a "merchant flag" if by that is meant a ship's ensign. He may mean one displayed by a merchant on land, in which case it is mere decorative bunting like the red-white-blue ("FOR SALE") banners seen today. Can you give us information on this flag. It has the St George Cross as background, with the Welsh Dragon centrefold of it. I have been told that it was a house flag, to an old company that use to have our ship (I am in the Merchant Navy). That's all that anybody seems to know. This may have been one of the house flags of the BP Tanker Company. It is shown in the 1963 edition of "Flags, Funnels and Hull Colours", though the beast, semi-upright on a green diamond, looks to me, more like a lion than a dragon. An earlier house flag of the British Tanker Company in the 1930's was similar but had a yellow Iranian lion on the green diamond. Just speculation here, but I wonder if what looked Welsh (white-green with dragon) might not have been Iranian (green-white-red with lion). I say that because David's mention of an Iranian lion prompts the recollection that BP originated as the Anglo-Persian (later Anglo-Iranian) Petroleum Company and therefore might plausibly have used a St. George flag defaced with some version of the imperial Iranian flag. This is probably correct. The British Tanker Company's flag was a red, over white, over red, with the centre of the white stripe enlarged to form a circle containing black letters; a large T, flanked by a smaller B and C. In the mid-1930s, when Persia changed its name, and the oil concessions were renegotiated, the house flag was altered, "as a compliment to the Iranian Government, introducing the National Colours and the Iranian Lion". 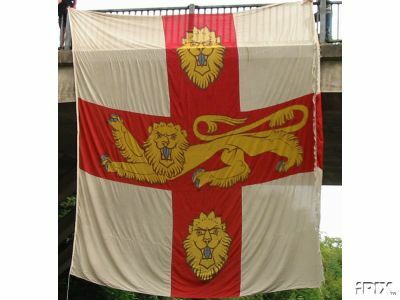 It was an English flag with a yellow passant guardant lion on a green lozenge in the centre. Later, probably in the mid-1950s when Iran nationalised the oil fields and refineries, the yellow lion was replaced by a what appears to have been a red rampant lion. By 1973 the house flag was white with a green border and BP in yellow on a central green shield. This image is of a flag flying from the main mast of an American paddle steamer, shown in a painting of unknown origin. The US flag flies on the stern. The painting of the steamship is c. 1860. The steamship was said to be the CENTRAL AMERICA, however, it is not; but it may be out of N.Y.C. The appearance of this flag to me suggests that it is not a house flag, but rather either fanciful or else seen briefly and not recorded accurately. That flag looks almost like the H flag. My best guess is that is may be either that (painted wrongly) or it could be the burgee of a Yacht Club, although those flags are usually triangular.